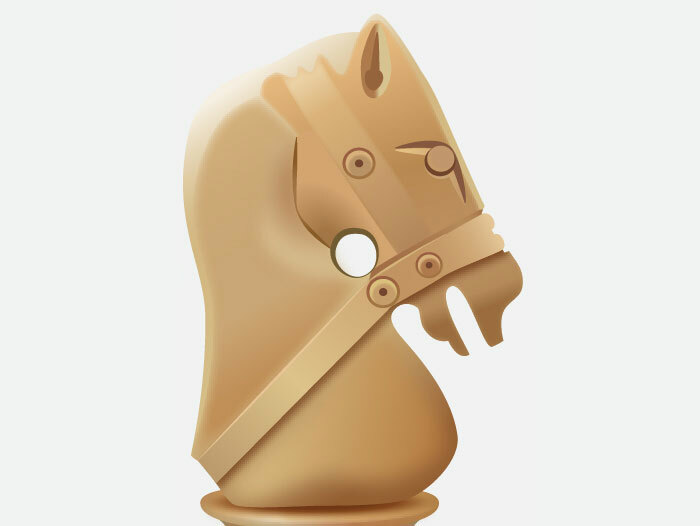 In this video tutorial, you will learn how to create a knight chess piece in Adobe Illustrator. 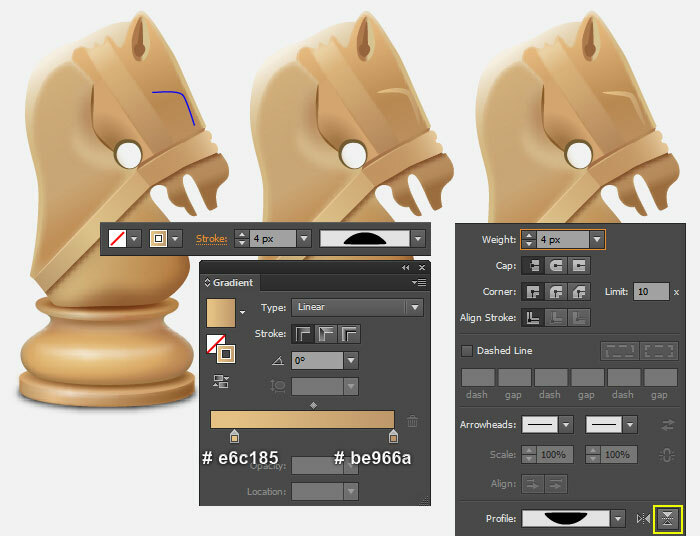 You will start from basic shapes and with a few distortion techniques that involve the Convert Anchor Point Tool, Direct Selection Tool, Transform and Pathfinder panels you will easily create the shapes that you need. The Pen Tool also plays an important role in this tutorial along with a bunch of gradients and some basic effects. Let’s start! 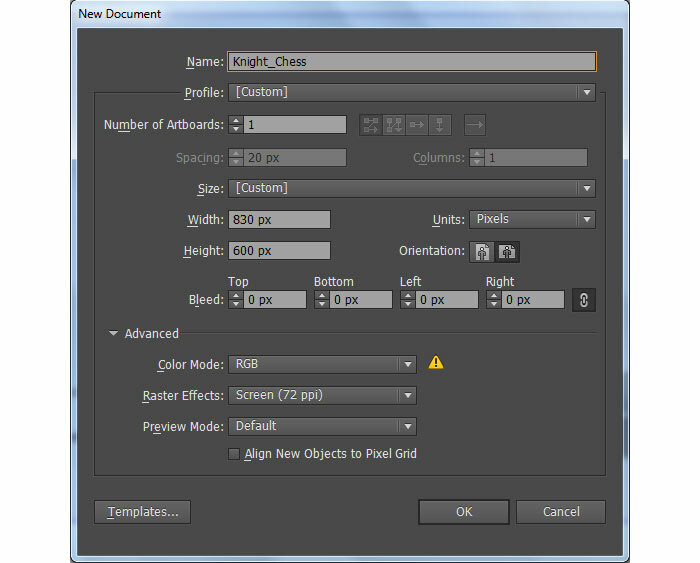 Launch Illustrator and then press (Ctrl + N) to create a New Select Pixels from the Units drop-down menu, enter 830 in the width box and 600 in the height box then click on the Advanced button. Select RGB, Screen (72ppi) and make sure that the Align New Objects to Pixel Grid box is unchecked before you click OK. 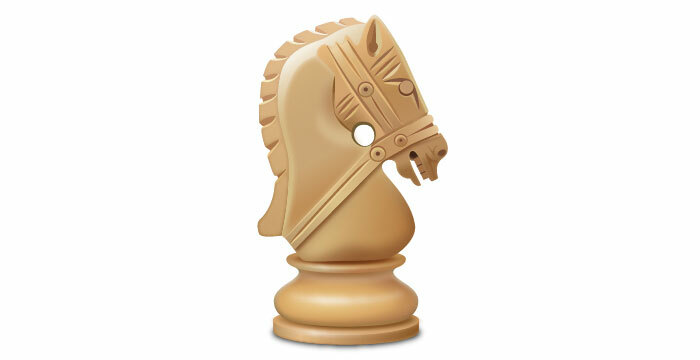 Create the Base of the Knight Chess Piece. 2. 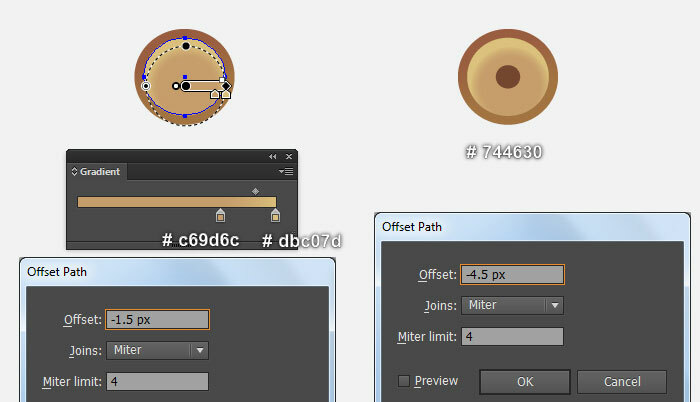 Pick the Ellipse Tool (L) and create a 146 by 26px black ellipse. Make a copy (Ctrl +C, Ctrl +F) of the black ellipse, then replace the existing stroke color of the copy with red. 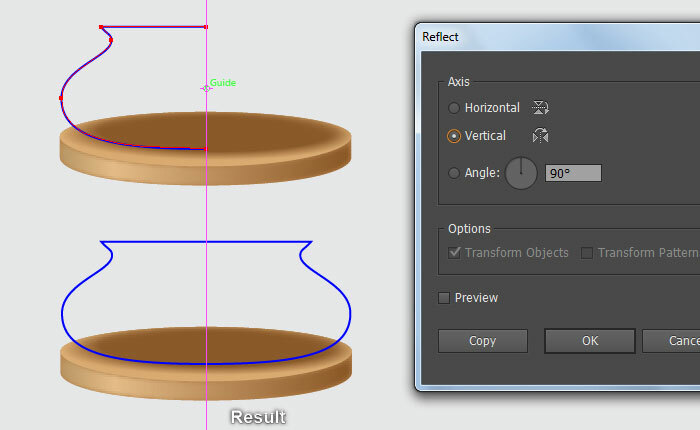 Keep the newly created ellipse and open the Transform panel (Window > Transform), then change H to 27px. Finally move the red ellipse 10px up. 3. Select the red ellipse and make a copy (Ctrl +C, Ctrl +F) of it, then replace the existing stroke color of the copy with green. With the help of the Direct Selection Tool (A) and the Shift, select four anchor points highlighted with red. Then click on the “Cut path at selected anchor points” icon from the Properties This make the green and the black ellipses become four curved paths. Select two paths like you see in the second image and remove them. Now reselect the remaining two curved paths, right click on the artboard and then select the Join section from the drop-down menu. Next right click on the artboard again, then select the Join section. 4. Select the red ellipse and the green object, then make a copy (Ctrl +C, Ctrl +F) of them. 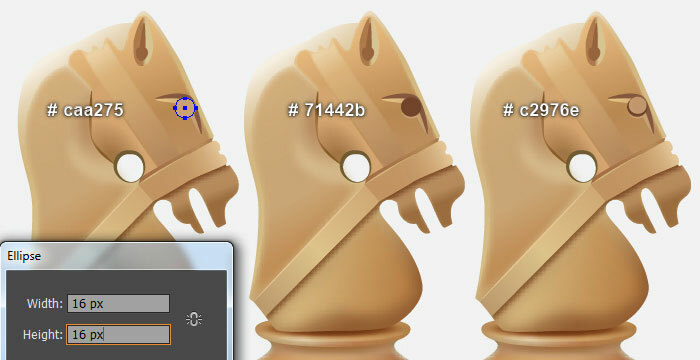 Still having the copies selected, then open the Pathfinder panel (Window > Pathfinder) and click on the Unite Remove the stroke of the resulting object and then fill it with orange (# b6824c). Finally send the resulting shape to back (Ctrl +Shift +Left Square Bracket). 5. Select the green object, remove its stroke and fill this object with the linear gradient as shown in the first image. Keep the resulting shape selected and go to the Effect > Stylize > Feather… Enter a 3px Radius and click OK. Continue select the red ellipse, remove its stroke and fill this object with the radial gradient as shown in the third image. Make a copy (Ctrl +C, Ctrl +F) of the resulting ellipse, then replace the existing fill color of the copy with new radial gradient. Finally apply a 6px Feather effect for the newly created ellipse. 6. Show the Rulers (View > View Rulers > Show Ruler) or (Ctrl +R). Next drag a vertical guide from the Rulers (if the guides locked, go to the View > Guides > Lock Guides) or (Ctrl +Alt + ;). 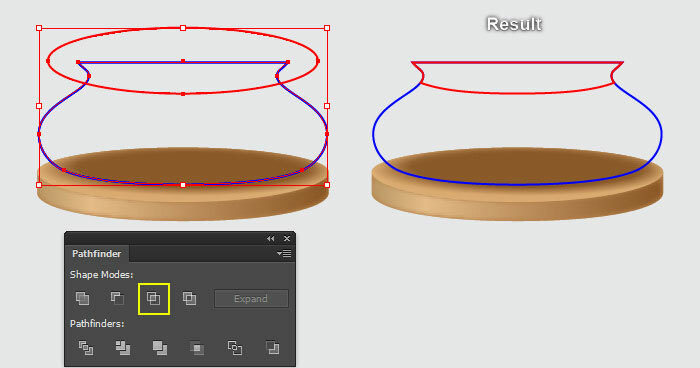 Now select the last ellipse created in the step 5, hold down the Shift, click on newly created guide, release the Shift and then click on the last ellipse created in the step 5 again (to fixed its position). 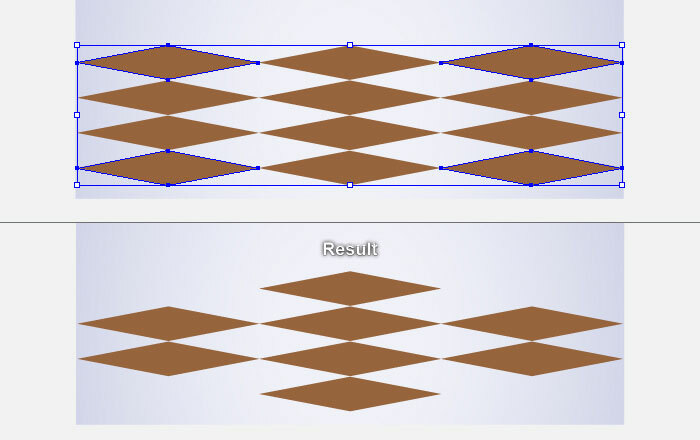 Next open the Align panel (Window > Align) and click on the Horizontal Align Center Now pick the Pen Tool (P) and create a blue path like you see in the second image. 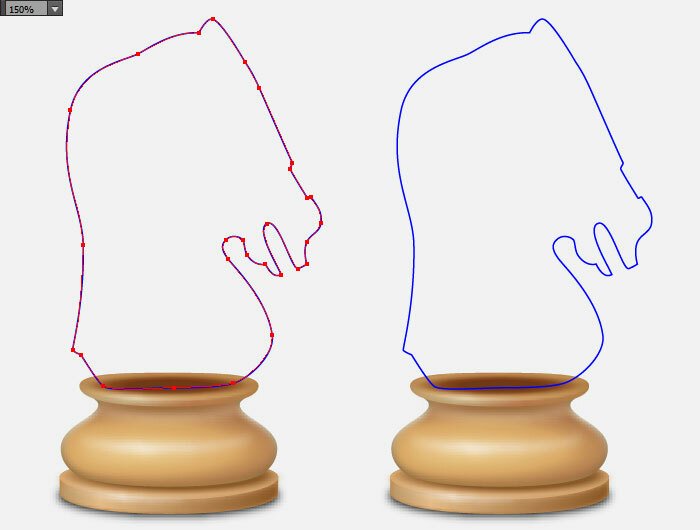 Focus on the third image, pick the Convert Anchor Point Tool (Shift +C), click on the upper anchor point highlighted with red, then hold mouse and drag it down. Don’t forget to hold the Shift key on the keyboard for straight dragging. Continue click on the lower anchor point highlighted with red, hold mouse and drag it down. Keep working with the Convert Anchor Point Tool (Shift +C), click on the bottom anchor point of the blue path, then hold mouse and drag it to the right. 7. After you are done adjusting the shape of the blue path, reselect it, pick the Reflect Tool (O), then hold down Alt and click on the vertical guide. In the Reflect dialog box, check the Vertical and click Copy. Now reselect the two blue paths, then press (Ctrl +J) twice times to connect these two paths. Finally select and remove the guide. 8. Pick the Ellipse Tool (L) and create a 135 by 33px red ellipse, then place it to the position like you see in the first image. Select the blue object and make a copy (Ctrl +C, Ctrl +F) of it. Keep this copy selected, hold down the Shift and click on the red ellipse. Next open the Pathfinder panel (Window > Pathfinder) and click on the Intersect Now reselect the blue object, remove its stroke and fill this object with the linear gradient as shown in the fourth image. Make a copy of the resulting shape, then replace the existing fill color of the copy with radial gradient as shown in the fifth image. 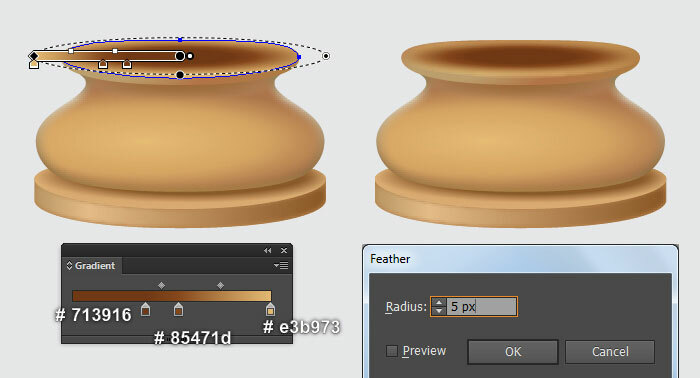 Next apply a 6px Feather effect for the resulting shape. Continue select the red object created in this step, remove its stroke and fill this object with the radial gradient as shown in the next to last image. Finally apply a 8px Gaussian Blur effect for the resulting shape. 9. Pick the Ellipse Tool (L) and create a 119 by 27px black ellipse, then place it to the position like you see in the first image. With the help of the Convert Anchor Point Tool (Shift +C) and the Shift, extend the handles of the left and the right anchor point of the newly created ellipse. Next select the top anchor point of this black ellipse and move it 5px Next reselect the black ellipse, make a copy (Ctrl +C, Ctrl +F) of it and replace the existing stroke color of the copy with red. 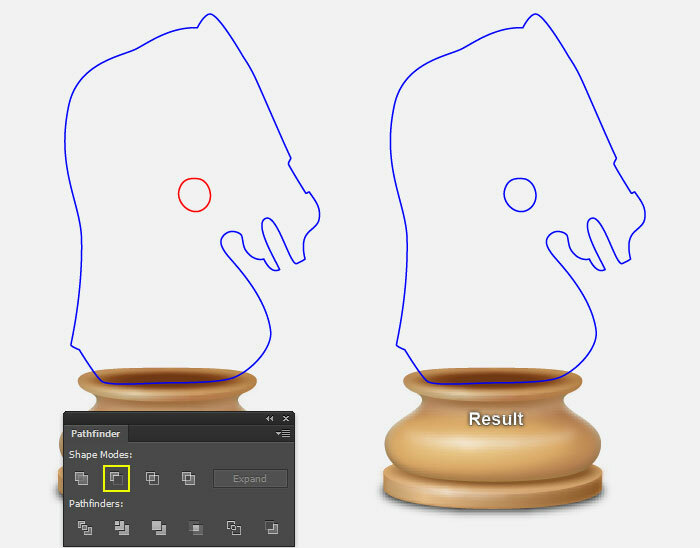 Next pick the Direct Selection Tool (A), select the bottom anchor point of the newly created ellipse and move it 3px up. Keep working with the Direct Selection Tool, shorten the lower handles of the right and the left anchor point of the red ellipse. Now focus on the sixth image, select the black ellipse, remove its stroke and fill this object with the radial gradient. Continue select the red ellipse, remove its stroke and fill this object with the radial gradient as shown in the next to last image. Then apply a 5px Feather effect for the resulting ellipse. 10. We are going to start making highlights and shadows on the base to give it more of a 3D look. With the help of the Pen Tool (P) and the Gradient Tool (G), create a soft orange shape like you see in the first and the second images. 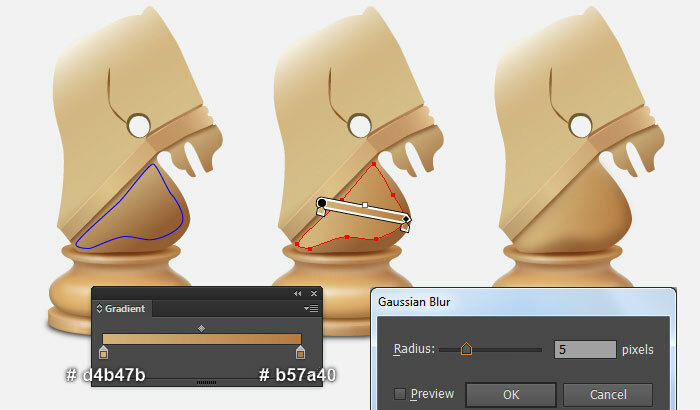 Next apply a 4px Gaussian Blur effect for the newly created shape. Now focus on the fourth image, draw a curved path with the Pen Tool (P) and give it a 4px stroke for the moment. Next apply the Width Profile 5 and the linear gradient within stroke for the newly created path. Continue create another curved path, with 1px very soft orange stroke (# ebd7ba) and no fill. Then apply the Width Profile 1 for the newly created path. Finally reselect the two curved paths created in this step and apply a 3px Gaussian Blur effect for them. 11. Draw a curved path with the Pen Tool (P) and give it a 2px stroke for the moment. 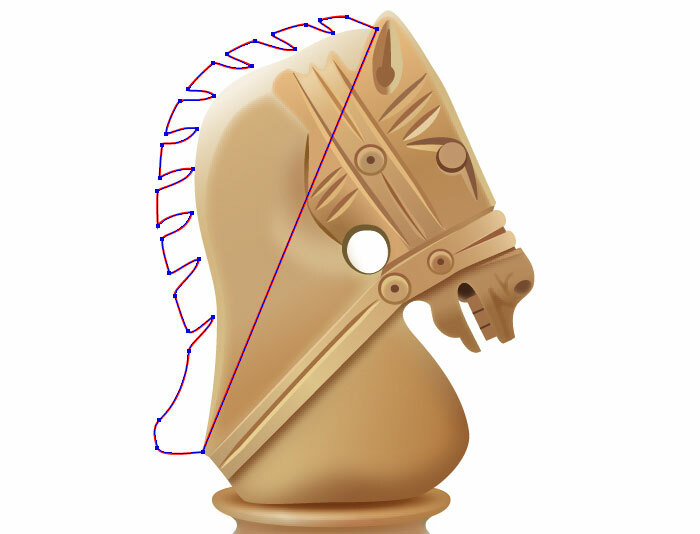 Next apply the Width Profile 5 and the linear gradient within stroke for the newly created path. Continue create another curved path like you see in the second image. Reselect the newly created path, then pick the Eyedropper Tool (I) and click on the first path created in this step. This will copy all existing appearances from the first path created in this step onto the newly created path. Next change the stroke weight of the resulting path to 1px. Keep this path selected and open the Stroke panel (Window > Stroke), then click on the Flip Along Finally reselect the two curved paths created in this step and apply a 2px Gaussian Blur effect for them. 12. 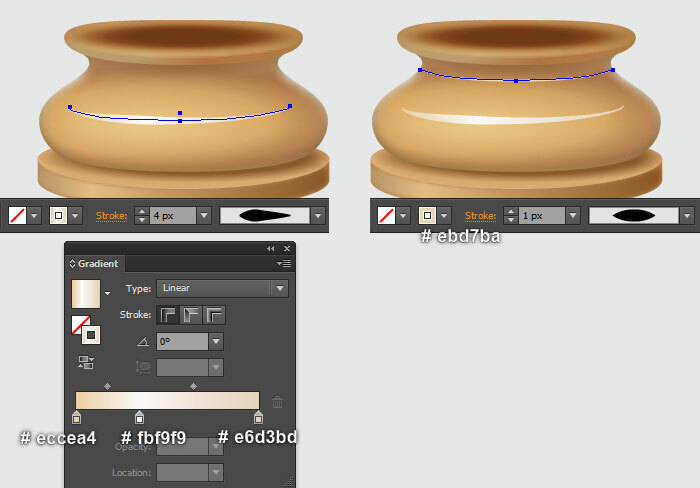 Pick the Ellipse Tool (L) and create a 5 by 22.5px ellipse, then place it to the position as shown in the first image. Remove the stroke of the newly created ellipse and fill this object with black (# 000000). Apply a 3px Gaussian Blur effect for the resulting ellipse, then send this ellipse to back (Ctrl +Shift +Left Square Bracket). The base is ready and looks like in the last image. 13. 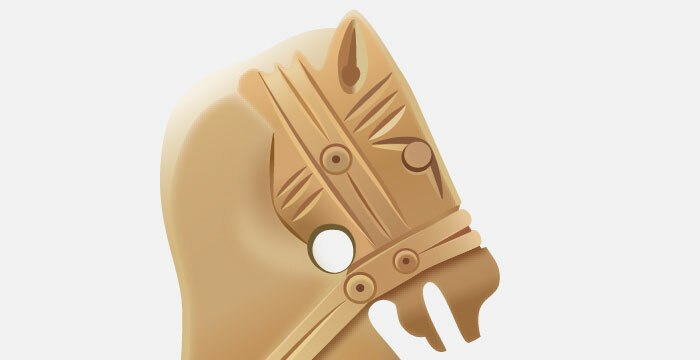 With the help of the Pen Tool (P), create an object with shape of horse’s head. Next create a red object like you see in the third image. Once your object is drawn, make a copy (Ctrl +C, Ctrl +F) of it. Keep the copy selected, hold down the Shift and click on the blue object created in this step. 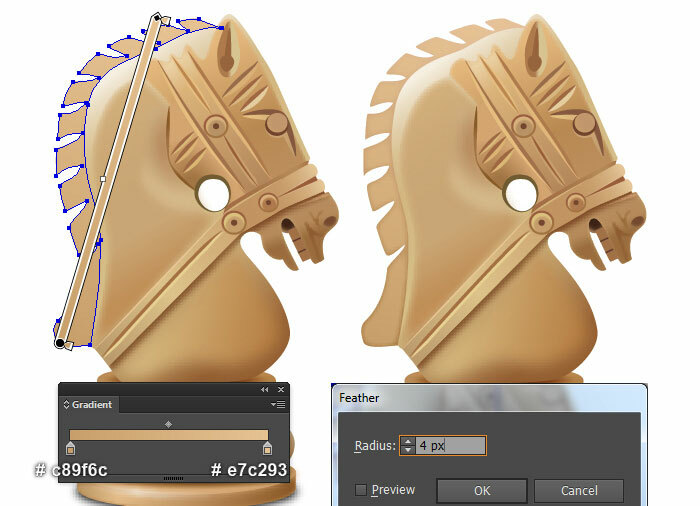 Open the Pathfinder panel (Window > Pathfinder) and click on the Minus Front Then remove the stroke of the resulting compound path and fill this object with the linear gradient as shown in the last image. 14. 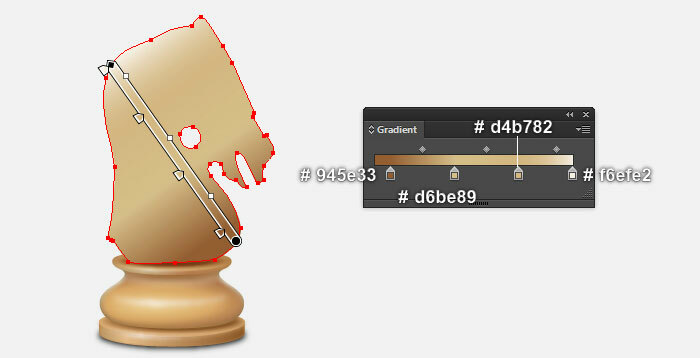 Select the red object created in the step 13 and bring it to front (Ctrl +Shift +Right Square Bracket). 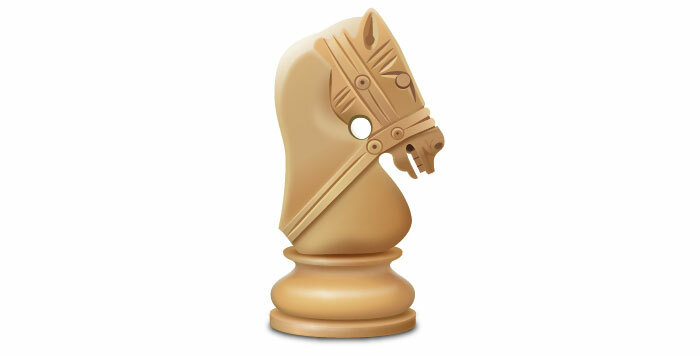 Change the stroke weight of this object to 5px and replace the existing stroke color with dark moss green (# 715b33). 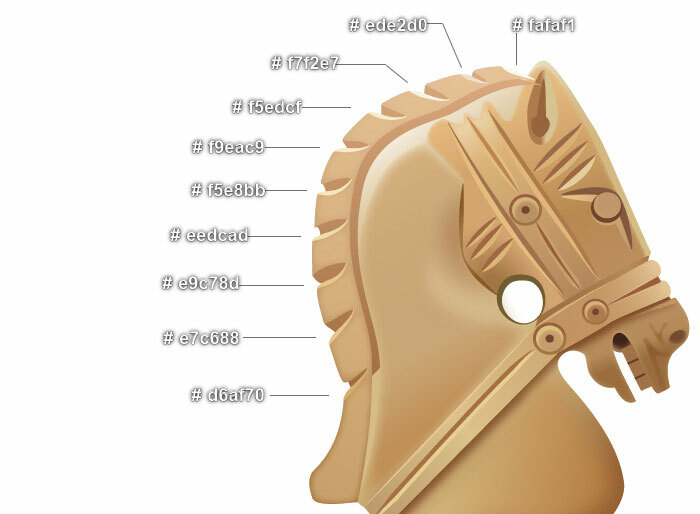 Then apply the Width Profile 6 for the resulting object. Continue draw a curved path with the Pen Tool (P) and give it a 2px dark orange stroke (# a27344) for the moment. Next apply the Width Profile 2 for the newly created path. 15. 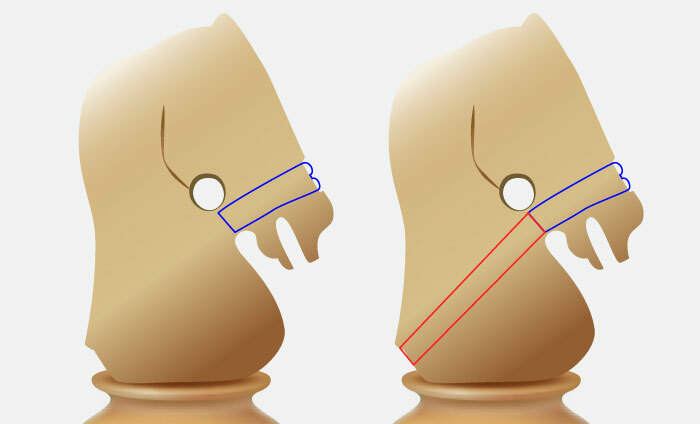 With the help of the Pen Tool (P) and the Gradient Tool (G), create two shapes like you see in the images below. Reselect the two newly created shapes and make a copy (Ctrl +C, Ctrl +F) of them. 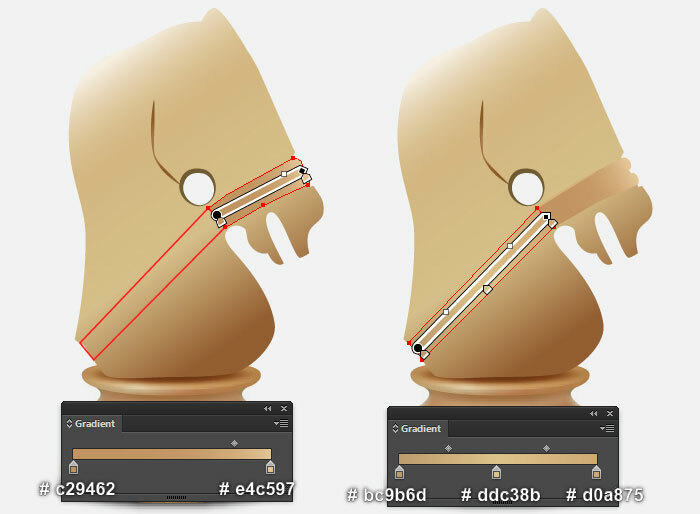 Still having the copies selected and go to the Effect > Stylize > Drop Shadow… Follow the data like you see in the fifth image and click OK. Now select the compound path created in the step 13 and make a copy of it, then bring the copy to front (Ctrl +Shift +Right Square Bracket). 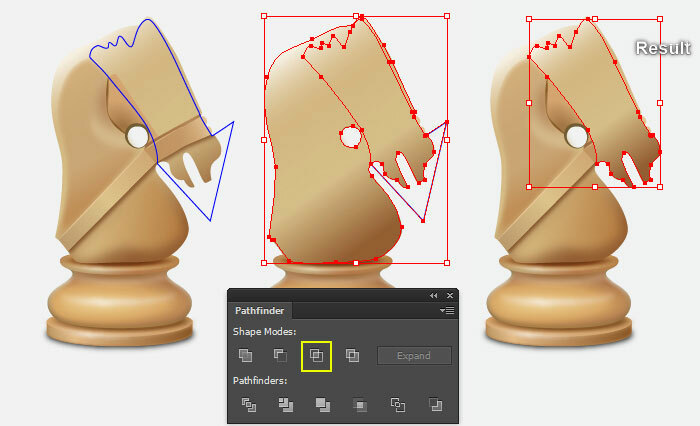 Having the newly created compound path, hold down the Shift and click on the two shapes with shadow effects applied in this step. 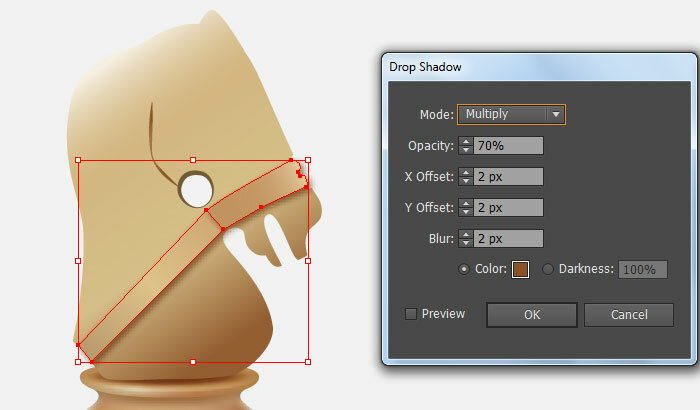 Right click on the artboard and then select the Make Clipping Mask section from the drop-down menu. 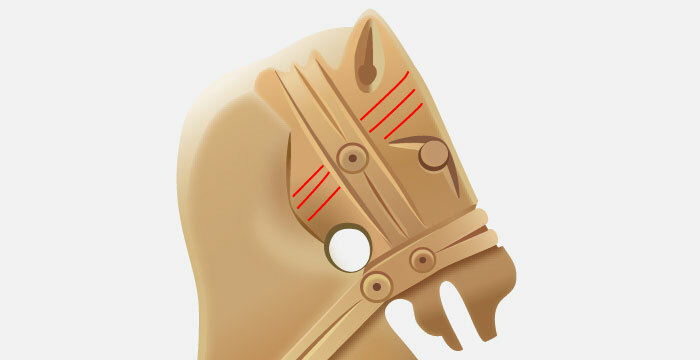 Next hide the clipping set behind the two first shapes created in this step. 16. With the help of the Pen Tool (P) and the Gradient Tool (G), create a dark orange shape like you see in the first and the second images. Keep working with the Pen Tool (P), create a path as shown in the third image, with 1px slightly orange stroke (# d7b57c) and no fill. 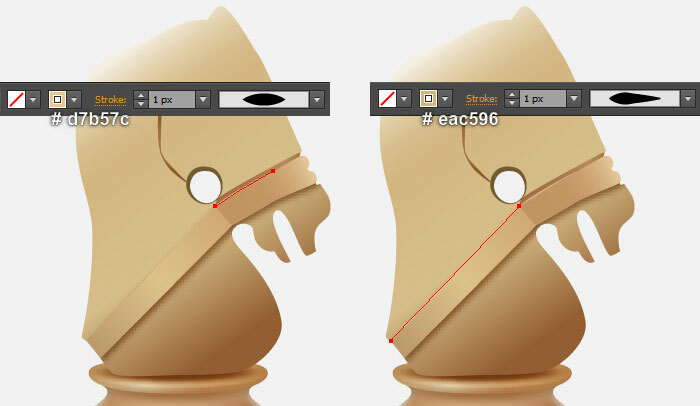 Continue create another path as shown in the last image, with 1px very soft orange stroke (# eac596) and no fill. 17. With the help of the Pen Tool (P) and the Gradient Tool (G), create a shape like you see in the first and the second images. 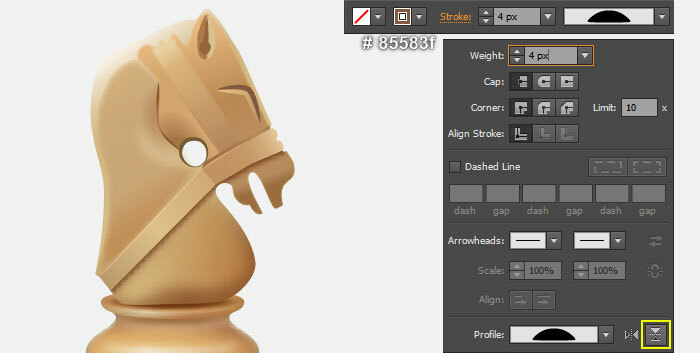 Then apply a 5px Gaussian Blur effect for the newly created shape. Having the resulting shape selected, press (Ctrl +X) to cut it. 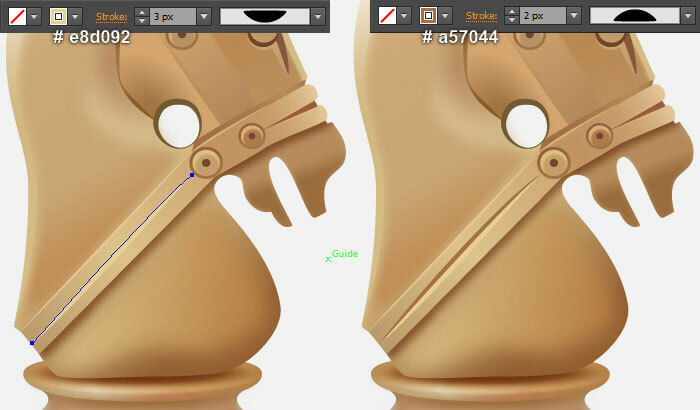 Then pick the Selection Tool (V), double-click on the clipping set created in the step 15 and press (Ctrl +F) to paste the shape was cut in this step. Finally, double-click on the anywhere outside of the clipping set. 18. 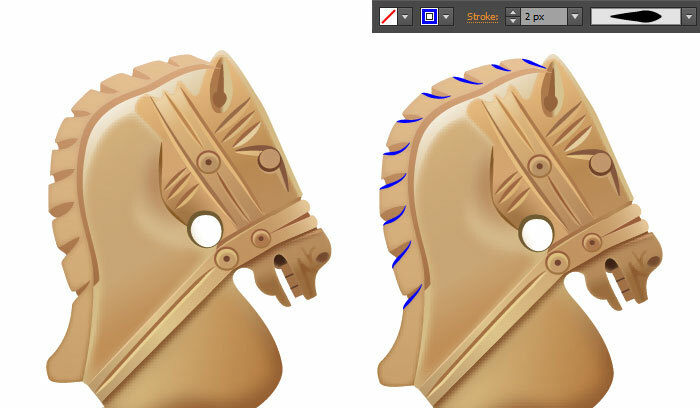 Pick the Pen Tool (P) and create an object like you see in the first image. Once your object is drawn, remove its stroke and fill this object with the linear gradient as shown in the second image. 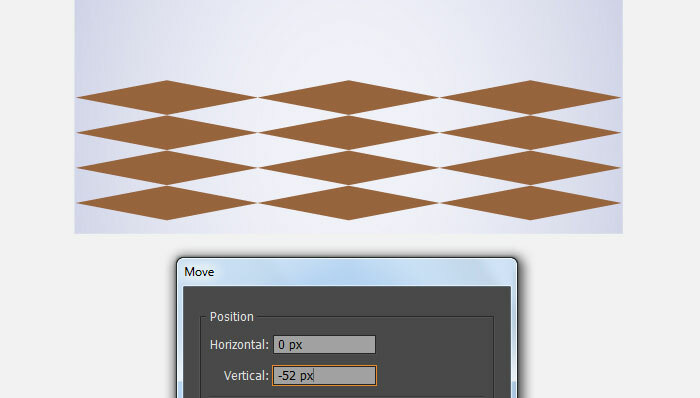 Then apply a 6px Feather effect for the resulting shape. 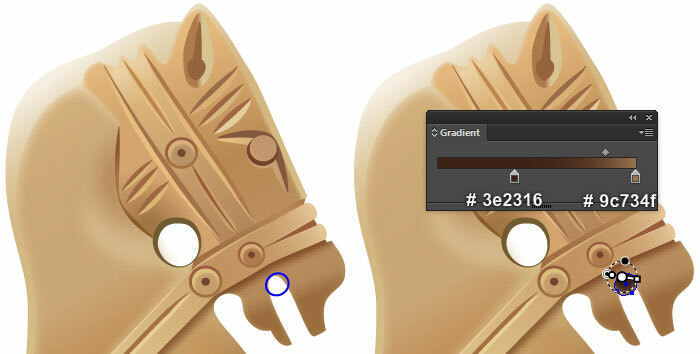 With the help of the Pen Tool (P) and the Gradient Tool (G), create two shapes like you see in the last five images. 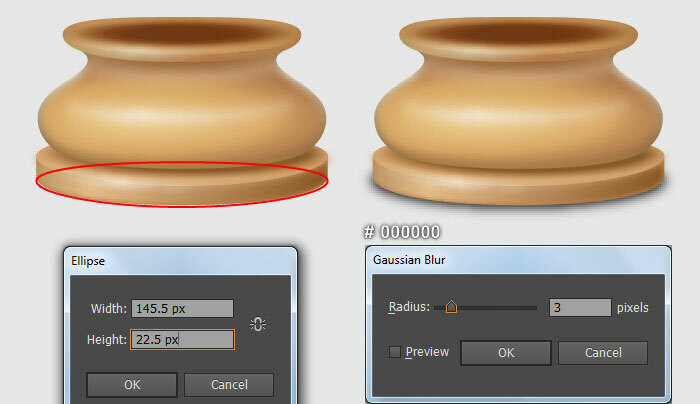 Next apply a 3px Gaussian Blur effect for the lower shape. 19. With the Pen Tool (P), create a blue object like you see in the first image. Next select the compound path created in the step 13 and make a copy (Ctrl +C, Ctrl +F) of it, then bring the copy to front (Ctrl +Shift +Right Square Bracket). Still having this copy selected, hold down the Shift and click on the blue object created in this step. 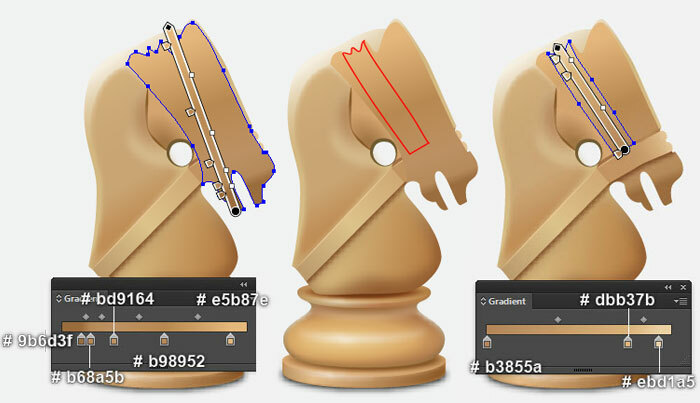 Open the Pathfinder panel (Window > Pathfinder) and click on the Intersect Next replace the existing fill color of the resulting shape with new linear gradient as shown in the fourth image. 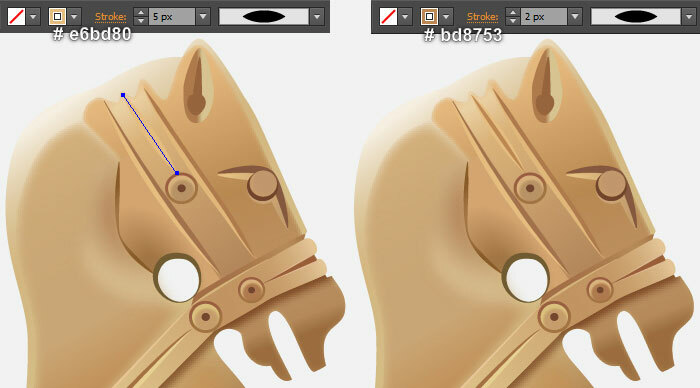 Continue with the Pen Tool (P) and the Gradient Tool (G), create a shape like you see in the two next-to-last images. Finally reselect the two shapes created in this step and apply a 3px Feather effect for them. 20. Next comes the ear. With the help of the Pen Tool (P) and the Gradient Tool (G), create a shape like you see in the first and the second images. 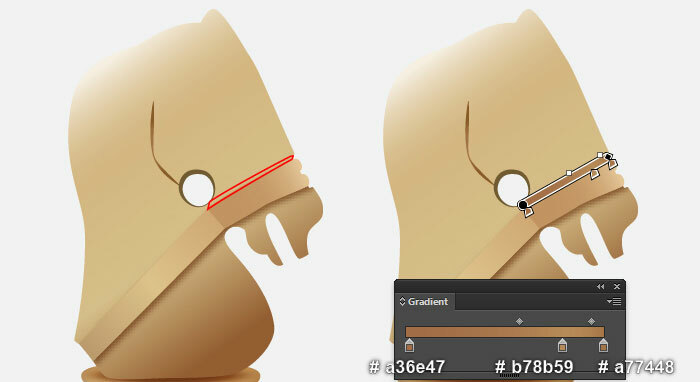 Keep working with the Pen Tool (P), create a dark orange shape (# 97643e) as shown in the third image. 21. We will continue with the eye. 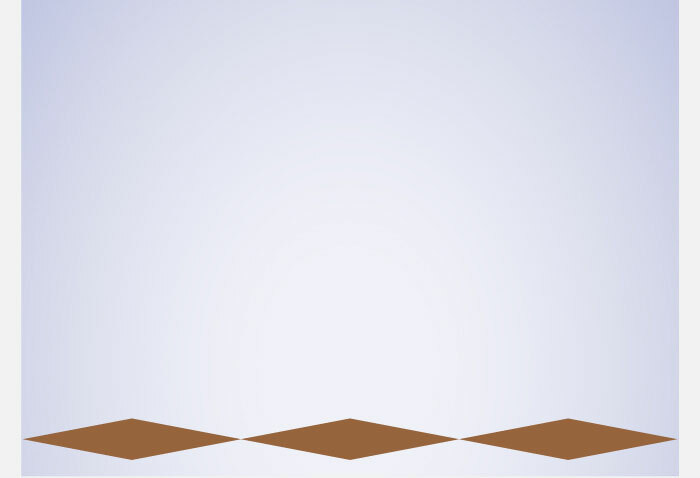 Pick the Pen Tool (P) and create a blue curved path like you see in the first image. Change the stroke weight of the newly create path to 4px and replace the existing stroke color with the linear gradient within stroke. Then apply the Width Profile 6 for the resulting path. Keep this path selected and open the Stroke panel (Window > Stroke), then click on the Flip Across The resulting path should look like the third image below. Still having this path selected and make a copy (Ctrl +C, Ctrl +F) of it. Replace the existing stroke color of the copy with dark orange (# 85583f). Make sure that the dark orange path is still selected and click on the Flip Across icon. 22. Pick the Ellipse Tool (L) and create a 16 by 16px slightly orange ellipse (# caa275), then place it to the position as shown in the first image. Make a copy (Ctrl +C, Ctrl +F) of the newly created ellipse. Reduce the size of the copy and replace the existing fill color of it with very dark orange (# 71442b). 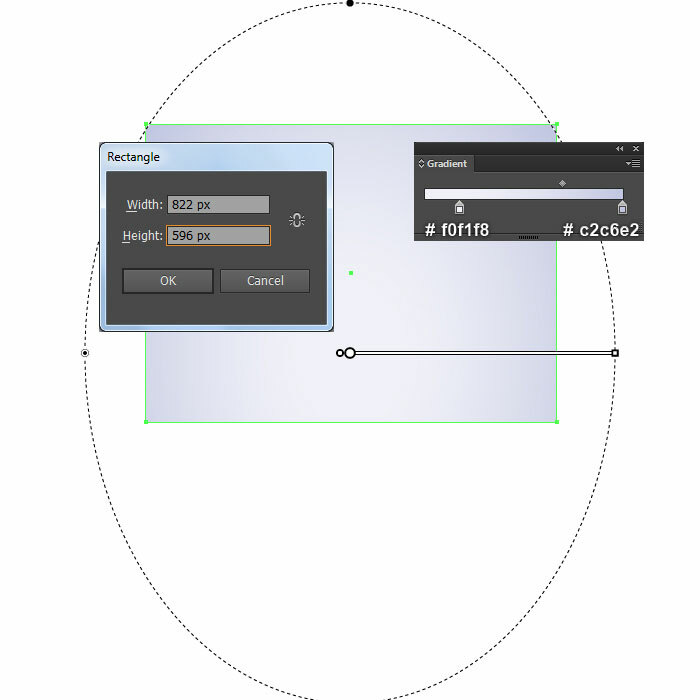 Then move the resulting ellipse 1px Make a copy of this ellipse and reduce the size of the copy. Next replace the existing fill color of the newly created ellipse with slightly orange (# c2976e). Finally move the resulting ellipse 1px up. 23. With the help of the Pen Tool (P) and the Gradient Tool (G), create a shape like you see in the first and the second images. 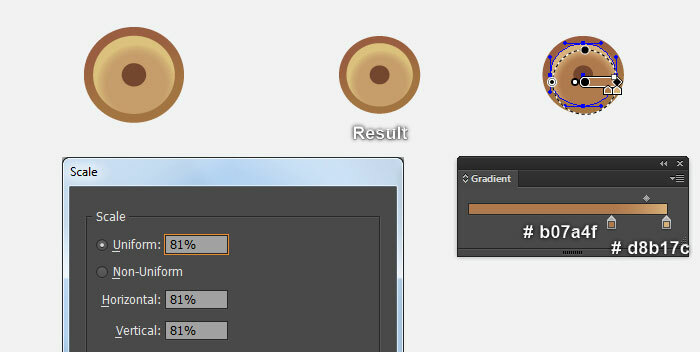 Reselect the newly created ellipse and go to the Object > Path > Offset Path… Enter a -1.5px Offset and click OK. Then replace the existing fill color of the newly created ellipse with the radial gradient as shown in the third image. Still having the resulting ellipse selected and open the Offset Path dialog box again. Enter a -4.5px Offset and click OK, then replace the existing fill color of the newly created ellipse with dark orange (# 744630). Finally select and group (Ctrl +G) three ellipses created in this step. 24. Select the group created in the step 23 and make a copy (Ctrl +C, Ctrl +F) of it, then move the copy to new position. Next pick the Direct Selection Tool (A), click on the medium ellipse of the newly created group. Then replace the existing fill color of this ellipse with new radial gradient as shown in the second image. Continue select the group created in the step 23 again and go to the Object > Transform > Scale… Check the Uniform, enter a 81% in the Scale box and click Copy. Then move the newly created group to the new position. Next pick the Direct Selection Tool (A) and click on the medium ellipse of the new group. Then replace the existing fill color of this ellipse with new radial gradient as shown in the third image. Finally place the three newly created groups to the positions like you see in the last image. 25. With the Pen Tool (P), create a path as shown in the first image, with 5px very soft orange stroke (# dfba95) and no fill. Then apply the Width Profile 4 for the newly created path. Keep the resulting path selected and make a copy (Ctrl +C, Ctrl +F) of it. Change the stroke weight of this copy to 3px and replace the existing stroke color with dark orange (# 9a5e39). Continue create another path like you see in the third image, with 3px very soft orange stroke (# e8d092) and no fill. Then apply the Width Profile 6 for the newly created path. Keep this path selected and open the Stroke panel (Window > Stroke), then click on the Flip Across icon. Still having this path selected and make a copy (Ctrl +C, Ctrl +F) of it. Replace the existing stroke color of the copy with dark orange (# a57044) and then change the stroke weight to 2px. Make sure that the dark orange path is still selected and click on the Flip Across icon. 26. With the Pen Tool (P), create a slightly curved path as shown in the first image, with 4px very soft orange stroke (# e6bd80) and no fill. Then apply the Width Profile 6 for the newly created path. Keep this path selected and open the Stroke panel (Window > Stroke), then click on the Flip Across Still having the resulting path selected and make a copy (Ctrl +C, Ctrl +F) of it. Change the stroke weight of this copy to 2.5px and replace the existing stroke color with dark orange (# a3724d). Then apply the Width Profile 5 for the resulting path. Continue create another path like you see in the third image, with 4px soft orange stroke (# e2b77b) and no fill. Then apply the Width Profile 6 for the newly created path. Keep this path selected and click on the Flip Across icon from the Stroke panel. Still having this path selected and make a copy (Ctrl +C, Ctrl +F) of it. Replace the existing stroke color of the copy with dark orange (# af7a4d) and then change the stroke weight to 2px. 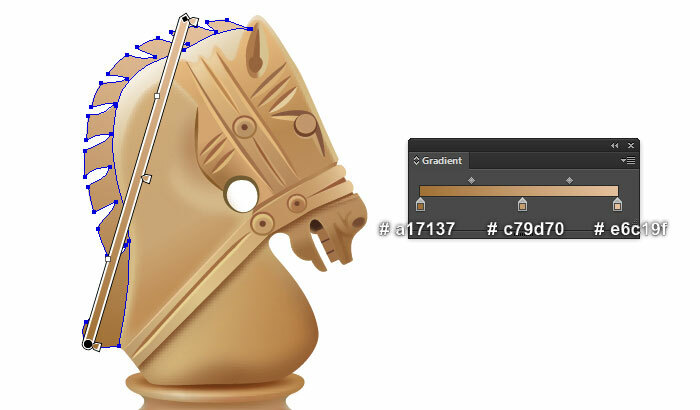 Make sure that the dark orange path is still selected and apply the Width Profile 3 for it. Likewise, repeat the same process to draw more paths as shown in the last four images. 27. Pick the Pen Tool (P) and create six red paths like you see in the first image. Reselect the path as shown in the second image, change the stroke weight to 4px and replace the existing stroke color with (# dbb077). Then apply the Width Profile 6 for the resulting path. Keep this path selected and open the Stroke panel (Window > Stroke), then click on the Flip Across Still having the resulting path selected and make a copy (Ctrl +C, Ctrl +F) of it. Change the stroke weight of this copy to 2.5px and replace the existing stroke color with dark orange (# 996c4b). Having the resulting path selected and then click on the Flip Across icon from the Stroke panel. Likewise, repeat the same process for the five remaining red paths as shown in the last image. 28. We will continue with the mouth. With the help of the Ellipse Tool (L) and the Gradient Tool (G), create an ellipse like you see in the first and the second images. Then send the newly created ellipse to back (Ctrl +Shift +Left Square Bracket). 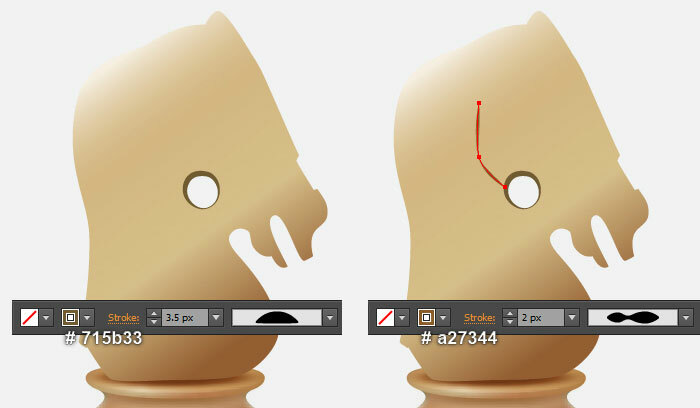 Next pick the Pen Tool (P) and create a dark orange shape (# a27147) as shown in the third image. Focus on the last image, pick the Line Segment Tool (\) create two lines, with a 1px very dark orange stroke (# 613c2e) and no fill. 29. With the help of the Ellipse Tool (L) and the Gradient Tool (G), create an ellipse like you see in the first and the second images. Next pick the Pen Tool (P) and create two paths as shown in the third and the fourth images. Once your paths are drawn, apply a 2px Feather effect for the newly created paths. 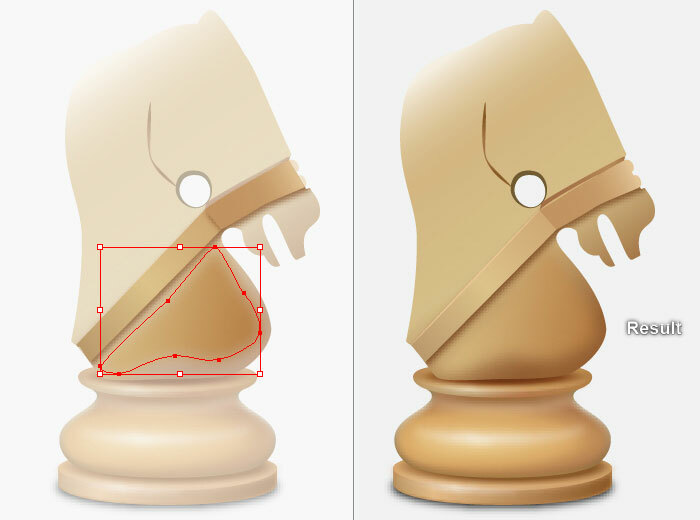 Continue create a slightly orange shape (# d5a676) as shown in the next to last image. Finally apply a 2px Feather effect for the newly created shape. 31. 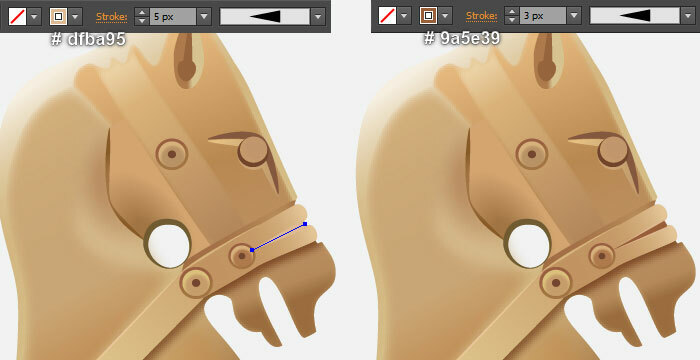 It’s time to draw the horse hair. Pick the Pen Tool (P) and create a red object like you see in the first image. 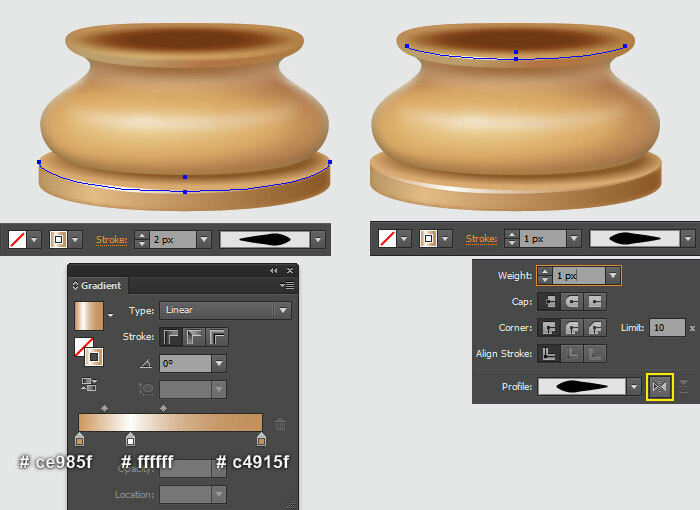 Once your object is drawn, reselect the compound path created in the step 13 and make a copy (Ctrl +C, Ctrl +F) of it. Then bring the copy to front (Ctrl +Shift +Right Square Bracket). Keep this copy selected, hold down the Shift and click on the red object created in this step. 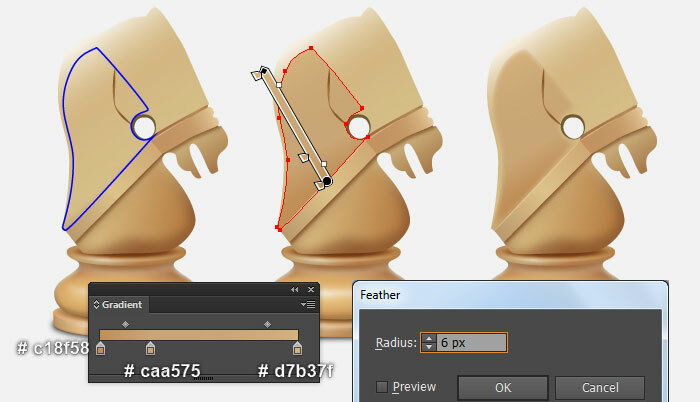 Next open the Pathfinder panel (Window > Pathfinder) and click on the Minus Front Remove the stroke of the resulting object and fill it with the linear gradient as shown in the fourth image. 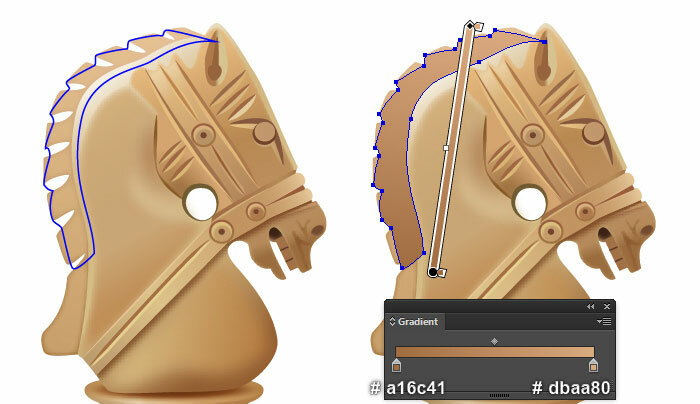 Make a copy of the resulting shape, then replace the existing fill color of the copy with new linear gradient as shown in the next to last image. Finally apply a 4px Feather effect for the newly created shape. 32. With the help of the Pen Tool (P) and the Gradient Tool (G), create a shape like you see in the first and the second images. Next hide the newly created shape behind the two shapes created in the step 31. Focus on the fourth image, pick the Pencil Tool (N), create some paths, with 2px blue strokes and no fill. Then apply the Width Profile 5 for the newly created paths. Finally replace the existing stroke colors of the blue paths as shown in the last image. 34. With the help of the Rectangle Tool (M) and the Gradient Tool (G), create an 822 by 596px rectangle like you see in the first image. Continue with the Rectangle Tool (M), create a 192 by 192px dark orange rectangle (# 97643e). 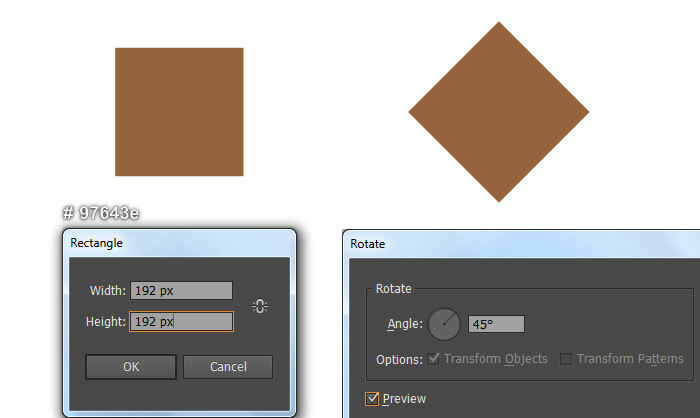 Reselect the newly created rectangle and go to the Object > Transform > Rotate… Enter a 45 degrees Angle and click OK. Keep the resulting shape selected, open the Transform panel (Window > Transform), then change W to 5px and change H to 51.5px. 35. Select the dark orange shape created in the step 34 and go to the Object > Transform > Move… Enter a 273px in the Horizontal box and click Copy. Then press (Ctrl +D) once to get the results like you see in the second image. Finally select and group (Ctrl +G) three dark orange shapes, then place the newly created group to the position as shown in the last image. 36. Select the group created in the step 35 and go to the Object > Transform > Move… Enter a -52px in the Vertical box and click Copy. Then press (Ctrl +D) twice to get the results like you see in the first image. Before you continue, select the four newly created groups and press (Ctrl +Shift +G) to ungroup them. Next select four dark orange shapes as shown in the second image and remove them. 37. Select all dark orange shapes created from beginning step 34 to this time, then change the Blending Mode to Luminosity. 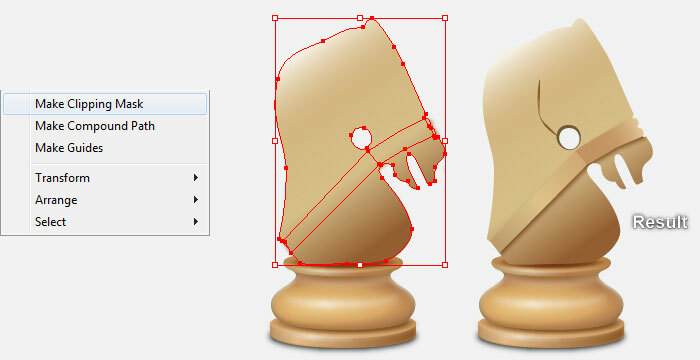 Now reselect three shapes as shown in the second image and reduce their Opacity to 80%. 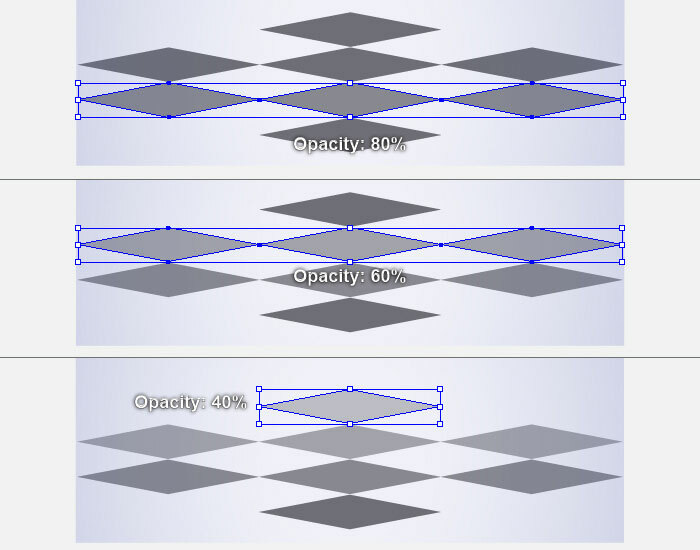 Continue select three shapes as shown in the third image and reduce their Opacity to 60%. Next select the shape as shown in the last image and reduce its Opacity to 40%. 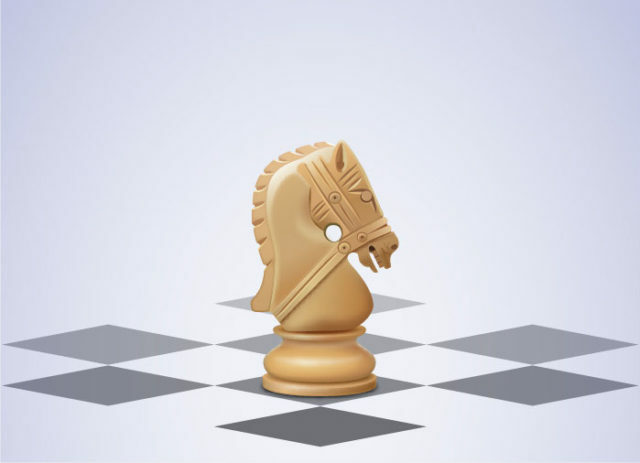 Finally place the knight chess into the newly created background.